“Pehchanon ji ye kaun hai” (guess who this is), is what Surjeet Singh often hears, as he relaxes on a cot in the sweltering summer heat on a farm in this Punjab village. Surjeet, 69, now plays this ‘guessing game’ several times a day, ever since he arrived in his native village last week, after more than 30 years of incarceration in Pakistan. “There are several people from villages and other places coming to meet me despite the heat. Sometimes, my family members ask me to guess who a particular person is. Most of them look so different and older, just like me. It is hard to guess every time and then I try to identify them by their names. I can re-collect some names though,” Surjeet Singh told IANS with several people sitting around him. “Ye budhi kaun hai (who is this old woman)?” was a question Surjeet popped in Punjabi to his relatives as an elderly woman came to meet him. He was told that she was a relative and he gave her a warm hug. Surjeet wears a pair of white kurta-payjama and slippers as he wanders through his daily life and receives scores of visitors or meets them around his village. He returned home Thursday to a tumultuous and teary welcome from family and friends. Among the visitors Saturday was Gurbaksh Ram, a fellow prisoner in Pakistan who returned to India in June 2006. “I was with Bapuji in the Lahore jail for several years. I was released in June 2006 after, spending over 20 years in Pakistani jails. When I read about his return, I wanted to meet him,” Gurbaksh told IANS. Among the visitors were two Sikh gentlemen who asked if he could recognise them. Besides the people who knew him from over three decades back, there are others who come to him with hope to hear about their own missing ones. “Some people get their files and photographs of missing family members who are believed to be in Pakistani jails. They show him (Surjeet) the photos to know if he has met that person in Lahore jail,” one of his relatives said. “He is very happy to be back in his country and among his family members and friends. Even though we were forced to sell our old house (where Surjeet lived) and land, this new house is lucky for us as it has brought him back,” Surjeet’s wife Harbans Kaur said. “In the (Pakistani) jail, he had some facilities like regular power supply which is not available here. He is back now and my tension is over. I will put the entire responsibility on him. He will take charge of things,” Harbans Kaur, who supported her children in adversity after Surjeet went missing in 1982, said with a smile. 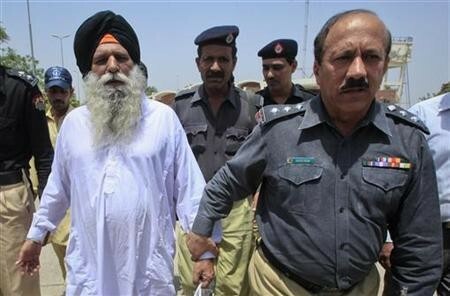 Surjeet languished in Pakistani jails for over 30 years after being arrested on charges of spying there. He was sentenced to death but the sentence was later commuted to life imprisonment. Surjeet was released from Lahore’s Kot Lakhpat jail early Thursday and made the road journey in a prison van to Wagah, on the Pakistan side of the border, before walking into India at the famous checkpost. While India and Pakistan trade barbs over terrorism, the country’s trade officials are making small but notable steps toward opening up their economies to one another. In October, authorities plan to open a second trade check-post at the Wagah border in Punjab state, the only land-crossing between the two hostile neighbors, in an attempt to boost trade volumes. The commerce ministers of both countries are expected to formally announce the new check-post at a meeting in New Delhi later this month. It might look like a baby step in normalizing frozen trade relations. But with so much else going wrong in India-Pakistan ties, it’s a welcome bit of positive news and one that is energizing Indian businessmen who work close to the border. 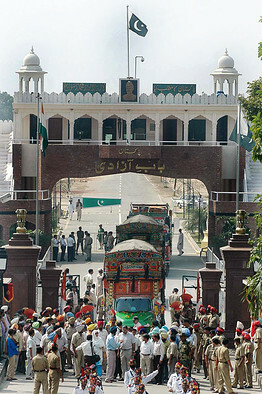 Currently, trucks that carry the meager flow of trade between India and Pakistan have to stop unloading at 3 p.m. because that’s when tourists from both sides start arriving at the Wagah border for the evening “Beating Retreat” ceremony – a display of nationalistic bravado that precedes the formal closing of the gates between the countries each evening. The new terminal will allow trade to continue until 7 p.m. and hopefully increase volumes passing through the check-post. Some business groups in Amritsar, a city near the Indian side of the border, are betting on an expansion of trade. Suneet Kochhar, director of a paper company based in Amritsar, is involved with a group of investors who have accumulated land to develop a freight terminal near the second trade check-post. “Once it’s operational, things will change,” Mr. Kocchar says. Land near the border has doubled in value in the past two years, he adds. To be sure, Pakistan and India have looked like moving ahead on trade in the past but things have gotten nowhere. Another attack like the one carried out by Pakistani militants on Mumbai in 2008, killing over 160 people, could easily nip the current optimism in the bud. Two-way India-Pakistan trade was a paltry $1.8 billion in the year ended March 31, 2010, basically unchanged over the past five years, while India’s trade with China has skyrocketed to $60 billion. Indian Prime Minister Manmohan Singh has said that India won’t be able to fulfill its economic potential unless it normalizes relations with Pakistan, which is a gateway to the Central Asian republics and beyond. For Pakistan, India is a huge potential market of 1.2 billion people. For now, businesses that want to get around restrictions have to ship goods at extra cost via ports like Dubai. The new check-post is a good start. Indian officials estimate two-way trade could easily jump to $2.7 billion in the short term. But there won’t be a seismic shift in trade volumes until both countries make serious efforts to expand the list of products that they can trade with one another. The current list encompasses just over 1,000 items. That has frustrated some business people. Sunil Behal, director at Poplon Chemie, an Amritsar-based company that makes chemicals to treat leather, says some of its key products are not on the list. The company currently exports only $7,000 worth of products to Pakistan each month out of its total global exports of over $180,000 in the same period, he says. There are tentative signs of seriousness. Ahead of the commerce ministers’ meeting later this month, officials from both sides met in New Delhi and thrashed out their differences. The minutes of the meeting are here. The officials were candid about the challenges. The new check-post, they agreed, will only be effective if both sides take other measures like simplifying customs procedures. Pakistan officials complained they were not even aware of the customs rules followed by India, and faced a number of non-tariff barriers to trade such as cumbersome testing of products by Indian authorities that can take weeks, according to the minutes. India lamented that Pakistan continues to put blocks in the way of trade, including proscribing a number of goods that aren’t allowed to enter Pakistan by road but instead have to come by rail. Mr. Kochhar, the paper company director, says he would export newsprint to Pakistan, but it’s uneconomical at the moment to ship via rail. Both sides complain about the difficulty of getting business visas and have promised to remove bureaucratic obstacles. The key, though, might be plans that India and Pakistan have to allow trade in most products, only protecting weak and strategic industries. The two countries are currently drawing up a list of these industries – known as a negative list – to submit to the other side. Don’t expect these issues to be ironed out overnight. Still, there’s movement which both nations are trying to build on. 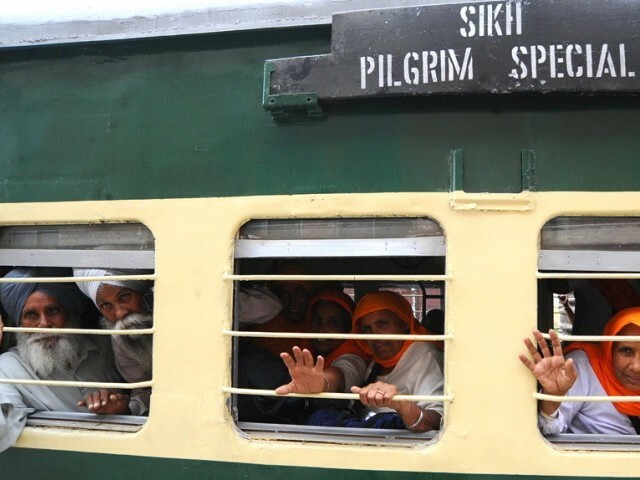 Over 2,000 Sikh yatrees from India arrived at the Wagah railway station on Monday to attend the 312th Baisakhi festival. gurudwara at Punja Sahib in Hassan Abdal where the festival begins today (Tuesday). As many as 13,000 Sikh men and women, from Pakistan and India, are expected to participate in the festival, which marks the commencement of the Sikh new year. On April 14, the pilgrims will go to Nankana Sahib, the birthplace of Guru Nanak, and return to Dera Sahib, Lahore, on April 17. They will also visit Dera Rohri Sahib, Aimanabad, and Kartarpur in Narowal, before they return to India on April 20. The Evacuee Trust Property Board (ETPB) has made special arrangements to provide free transport, accommodation and food to the pilgrims during their 10-day stay. Stalls of immigration, customs and a medical camp have been set up at the railway station.